When I was a kid I dabbled briefly with toy soldiers—you know, fighting battles in the sandpit, and later, making little flamethrowers out of tin foil and matches, that kind of thing—but I really wasn’t into it in a big way. The little men gaming started, as so many things did, when I was about thirteen and discovered Dungeons & Dragons. Some ingenious person out there started making little 25mm high fantasy fighters and ’orrible creatures out of pewter and tin, and I was hooked on the little buggers. I think from the moment I first saw them lined up on the shelves of the game shop they captured my imagination. Not only could you create little battles with them, but you could express your artistic urges and paint them, learning all kinds of tricky techniques to make those tiny antagonists look as real as possible. A little English company called Games Workshop started making figures for their Warhammer game, and the rest is history. 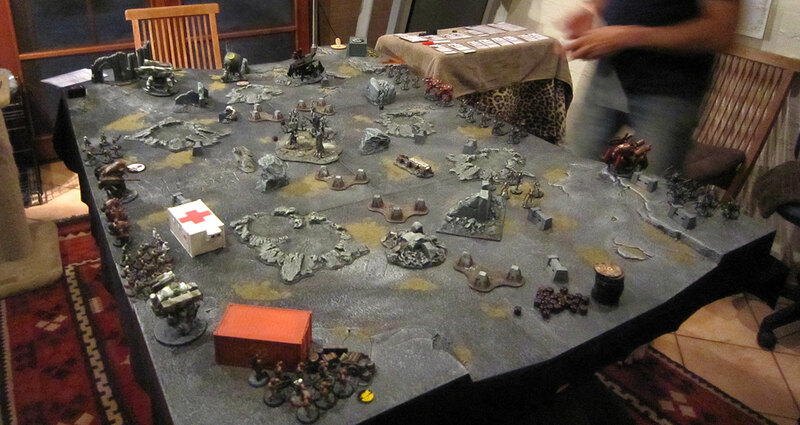 I wasn’t really that much into big armies facing across each other across a tabletop. Being a very meticulous painter, I never got enough figures painted, so I tended to prefer small-scale ‘skirmish’ level games like Necromunda and Advanced Space Crusade. But for people like me, who still have the eyes of a twelve-year-old when it comes to these things, the sight of a 6’x4′ table covered with little armies running about through beautifully modelled terrain still fires the imagination. I eventually got back into this kind of gaming with a pre-painted tabletop miniatures game called AT-43. Purists will shudder at this point. Prepainted miniatures?! Surely not! Well yeah, it took me a while to get used to the idea. But the fact is, with my schoolboy days long, long behind me, I have no time these days to paint the scores of little figures that a tabletop wargame requires. Pre-painted miniatures can go straight onto the tabletop, ready for battle; they still look great from the distance you usually see them, and gone are the days of figures cluttering the dining room table in a half-painted state. AT-43 is a sci-fi miniatures game by a now-defunct French company called Rackham, and I bought into it in a big way. The miniatures look great and are painted to a good standard (no doubt by assembly lines of Chinese workers; though I have discussed this subject with game publishers who tell me that this kind of thing is actually considered a good job and just a first step on the ladder for young workers). The game system is quick, fun and doesn’t involve remembering the equivalent of trigonometry tables to play. A good example: if you have a Medic in your unit, you can save a hit soldier by shouting out Medic!—possibly one of the greatest rules ever invented for a wargame. But these days, there are more things available that make tabletop gaming quick and easy to get into. Games Workshop released a modular 6’x4′ plastic battleboard that, while outrageously priced, solves all the old problems of making and storing a gaming surface. It packs away into a 2’x2′ carry bag, and once it’s painted, looks fantastic. Add a few of their plastic woods and hills and you have all the terrain you’ll ever need. In the bad old days you either had to make modular wood and polystyrene sections, or string a ping-pong table to the roof with a pulley system (don’t laugh, a friend of mine did this). And now other companies have stepped up and started making modular terrain boards too. So, after you’ve spent all this money—no doubt justifying it to your partner by pointing out that your hobby could be collecting vintage cars, and she should be grateful—your old school buddy who you’ve known for almost thirty years (gulp!) comes around one evening and you set up a game. You’re both on the wrong side of forty and playing with toy soldiers. So what? You have a fantastic time. A few beers and a few game turns later and you’re laughing your head off, embellishing the tiny dramas that happen on the table in front of you, making whooshing and dakka-dakka noises as another unit of soldiers lets fire with their assault rifles, cheering as the battle robot is blasted into smithereens by a lucky laser shot, chucking handfuls of dice like high rollers in Vegas, both leaning over the table to see if your opponent pulled off the lucky numbers to blow your favourite unit away. You may laugh, but it’s a damn sight better way to spend an evening than sitting in front of the television or plugging your cash into a one-armed bandit. With luck, I’ll be playing games like this until I shuffle off this mortal coil. Quite probably, in full command of my mental facilities because I’ve kept my brain so active learning game rules, and certainly happier because I’ve held on to my childlike imagination and sense of wonder. Playing with toy soldiers is a wonderful thing. I highly recommend it. Man I miss AT-43! I had a huge army of Gorillas but eventually I sold them all off when Rackham tanked because no one was playing anymore. It would be nice to see the game come back from some other company with the same quality of pre-painted miniatures. I hate to tell you, but last I heard the miniature molds were all deteriorating in a Chinese storeroom—ironically in the same building where Paulo Parente lives and works on Dust Tactics. I believe the person who owns them was left with a huge bill in the order of 600K when Rackham folded, and isn’t giving them to anyone who can’t reimburse him. In the meantime they falling apart. It’s very sad, but I very much doubt that AT-43 will return—unless of course someone gets hold of the licence to make a new range of miniatures. The licence for the fantasy game by Rackham, Confrontation, was picked up by Cyanide Studio to use in computer games, but I don’t think anyone got the AT-43 licence. But in the meantime, I’m happy to have a big collection of all the armies and still play and enjoy the game a lot. I’ve been enjoying Dystopian Wars by Spartan Games – the resin models are fantastically detailed, and the game is a rollicking good time – very thematic and enjoyable. DW looks great, and I love the theme. Unfortunately my terrain and armies are currently in storage with a recent move; I’m itching to get them all out again. In the meantime I’m rediscovering the old Rackham miniatures game Confrontation. DW is a great game – the system is good and just works – it also provides plenty of opportunities for thematic moments – great game. I still love AT-43. It is a shame Rackham went bankrupt. Don’t get to play AT all that often anymore but love the odd times I do. Hope you’re using my redesigned unit cards! I agree, and it’s a great shame the game itself was overshadowed by the controversy over Rackham moving to pre-painted plastics. It could have been the first true rival for the popularity of W40K. I’ve really been enjoying Dust Warfare. it was as easy to get into as AT43, and the rules are meaty enough to keep my attention. I’ve recently downloaded the PDF of the rules and will give it a shot when I get a chance. The figures would be interchangeable as well, if you wanted to give DW a scifi feel and were prepared to do the work to come up with appropriate stats (or wanted to fill out, say, the ONI faction in AT-43 wih Dust figures). I loved AT-43 when it came out along with their other creation Confrontation. I kept my Confrontation stuff but moved my small collection of AT-43 off to my nephew. I miss it but now have DUST which is proving to be quite a bit of fun. AT-43, Confrontation, and Dust—these are my three tabletop miniatures games of choice. Exciting to hear that there’s even the vaguest possibility of the game returning, though it sounds like a long way off. I can’t imagine there are too many players left out there. Perhaps they’re thinking of a Kickstarter campaign to revive it. Anyway, thanks for letting us know Mattias! I’m unclear between OD and the handful of Red Blok Kolossus boxes I’ve come across how point costs are determined. Even looking through your fantastic card and game references nothing jumps out to me. The point values are in the top left hand corner of all my unit cards. Army building is explained under ‘Recruitment’ in the summary.